Echoing Swamplandial and Tell the Waves I'm Home, a perfect debut for anyone who's navigated the seas of adolescence and lived to tell the tale. A.Z. McKinney is on the shores of greatness. Now all she needs is a boat. When the Sea of Santiago appeared overnight in a cow pasture in Arkansas, it seemed to some a religious miracle. But to high school sophomore A.Z. McKinney, it's her chance to make history– as its first oceanographer. All she needs, in the summer of 1989, is to get out on the water. Her plan is easier said than done, since the Sea's eccentric owner is only interested in using it as a tourist destination for beachgoers and devout pilgrims. A.Z. finally thinks she's found a co-captain and potential boyfriend in the edgy conceptional artist, Kristoff, who seems to want to help her build a boat. But between fighting with her best friend to searching for a tourist-terrorizing alligator (that may or may not be a crocodile) to getting caught between feuding churches and her controling parents, distractions are everywhere. With her self-determined oceanic destiny on the line, A.Z. finds herself at odds with everything she thought she knew about life, love, and the Sea. To know the truth about the Sea, and what she wants, A.Z. will have to decide whether to sink or float . . . But which one comes first? Alexandra Teague is the award-winning author of three books of poetry: Mortal Geography, The Wise and Foolish Builders, and Or What We Call Desire. Recipient of the 2010 California Book Award, a 2006-08 Stegner Fellowship, and a 2011 National Endowment for the Arts Fellowship, Alexandra is an associate professor of creative writing at University of Idaho and lives in Moscow, Idaho. "If you've read either of Alexandra Teague's two acclaimed poetry collections, then you'll already know how fascinating her mind is, and how gifted her pen. 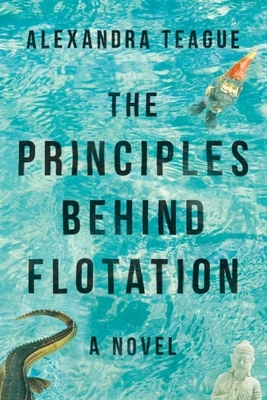 What you might not realize, but will discover, as I did, as soon as you crack the pages of The Principles Behind Flotation, is how quickly and completely she can create an absorbing other life in an absorbing other place, how big-hearted she is, and how funny. I loved this novel and the gentle magic of the Arkansas it creates." "Set alongside a miracle-induced inland sea in Arkansas, The Principles Behind Flotation is a buoyant, soulful ride through a teenage girl's summer of self-discovery. Alexandra Teague has an ear for sharp, witty dialogue and an eye for the metaphysical reaches of American culture, and her main characters, A.Z. and Kristoff, are as memorable for their brilliant capacity to see beyond their lives as for their funny, flawed love story." "The miracle of Teague's fiction is the way she shines a light on the ordinary matter of life to reveal its mystery and promise. She builds a town of endearing eccentrics, shaped as much by their own stories as their unlikely odds. At the center of it all is Anastasia Zoe, who navigates the shifting waters of identity, meaning, and desire with indomitable hustle and heart." "Slyly funny and full of wonder, The Principles Behind Flotation sails us out on the sea of first love with heart-breaking tenderness, wile, and wit. A.Z. is a character whose frankness and courage are matched only by her moments of intimate vulnerability. Teague navigates the coming-of-age currents with intelligence and compassion, reminding us that we've all been in that strange place of metamorphoses, where nothing is as it seems." "Teague deftly captures like a brain-scan in prose the jittery loping rhythms of adolescent yearning, all turbulent and gut-felt and intensely right now. A.Z. McKinney is a wonderful creation, and Alexandra Teague is a wondrous writer." "The Principles Behind Flotation is wryly observed and sharply funny. A.Z. McKinney is an irresistible protagonist and the story of her travails is told with enormous humor and unflinching clarity. This book is a delight."